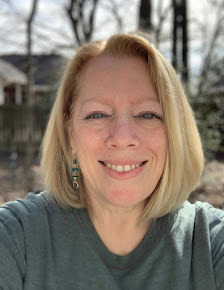 My Journey to Fit: Friday Mishmash - (Boat) Driver's Ed Needed! Friday Mishmash - (Boat) Driver's Ed Needed! Not a lot going on this week - Jeff has been traveling once again, the dog days of summer are upon us with a vengeance, and I've been doing my best to combat it by watching all the episodes of Mad Men on Netflix - you know, I don't smoke and never have, but I kinda feel the need for some Nicorette gum...my gosh, could there BE a more cigarette-centric show?!? Any case, I'm hooked. On the show, that is - not the cigs! The poor guy was splayed out for hours! He only moved when Paco went outside to check on him. Yeah, I'm sure that's what Paco was doing, "checking" on the squirrel's health and well-being. Riiight. This is the silly set of pictures from our day on the boat. As we were headed back to the dock, Terry told me that I should give driving the boat a try. Sure - how hard could it be? I asked John, and he gave me instructions (head for that water tower waaaayyyy in the distance, don't over correct - there may have been more, but apparently I stopped listening at that point in my eagerness to take control) and then he handed over the wheel. Well. It's a bit harder than it looks. Terry was documenting my experience on film, er, memory card, and I doubly laughed afterward to see not only my crazed panic, but the looks on Jeff's face throughout the saga. Please enjoy my boating awkwardness, and yes, I DO need to attend driver's ed for boating! Captain John explaining how to steer - this is when I really should have paid more attention. My face is flushing as I begin to panic because the boat is turning toward the left...what?!? And where is John? More panic as I realize he's gone below deck! Luckily Terry was right there, but she made no moves to take over, much as I needed it! Still panicking disguised as crazed laughter; Jeff is looking a little worried there. Me white-knuckling it while Jeff is demonstrating which way I should be turning the boat! For what it's worth, eventually I got us back on track. Then I offered the wheel to Jeff and he wouldn't take it, the big chicken! And I have to hand it to John, because you KNOW he had to have felt the boat turning as much as it was, and he didn't come rushing up get me away from the driver's seat. Terry was equally calm - I don't know how they did it. Driving the boat for a little while was fun, but all in all, I prefer to be a passenger! I'm wearing a white tank top underneath, but the shot is really overexposed and you can't see it. Darn dressing room lights! Have a great weekend - stay cool! I adore adore the picture of you in FULL ON (ok semi-panic) laugh. so vibrant and filled with JOY for life, Shelley. My lack of fashion sense & I are off and NOT giving any sartorial advice. Apparently Im 100% advice-free today...except keep laughing. HAHAHAHA, when I was a kid my dad only let me drive the boat once in a long while, and I was terrible at it just the way you are here! The best part was looking behind us and seeing the trail in the water zigzagging, LOL. My father couldn't believe how crooked it was! My younger sister, on the other hand, was perfect at it -- and she was 6 or 7 at the time. Awww, I am sorry the dress didn't work out, and how funny that I had secretly bought the striped one you were trying on! :) It is an oddly cut dress, and it does run big; it hangs on me on top too but it looks more like a billowy top over a slim skirt on me. Maybe because I have a giant rack, LOL. Too bad the dress didn't fit properly because it's a really nice dress, it looks good on you. I laughed out loud at the pics of you drive the boat. Even before I read that you write that Jeff looked worried I said to myself that he was looking scared. So much for trusting your wife right LOL. Hope you will have a great weekend Shelley. I giggled all the way through the boating photos, but don't worry I was laughing with you not at you. Driving a boat sounds really scary, I'll stick to driving on land! You look like you are having a great time though. That's a cute dress, too bad it didn't fit right. Sometimes Old Navy has some really good choices. Love the boat pics. You and your squirrel pics crack me up. Maybe you should name him and just adopt him into the family? The dress is very cute. Haven't been to Old Navy in a while. Maybe it's time? That is a very flattering dress. Haha on the boat pics. Does it steer in the opposite direction than you think you're going or is it the water or what? 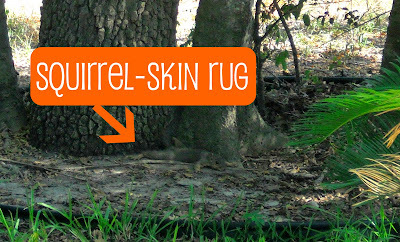 Oops, I forgot my favorite part--the squirrel skin rug. Very very funny! You cracked me up with the boat photos! Looks like a blast. And MadMen? I asked John if it was possible to get lung cancer from watching that show. I swear I started to smell cigarette smoke! Gotta be careful not to over correct when steering that sucker. OMG I would get so nervous going down the ship channel to Galveston and having to go past those giant tankers. Talk about sweating! I always look forward to my Friday morning Google reader, knowing you will be here! 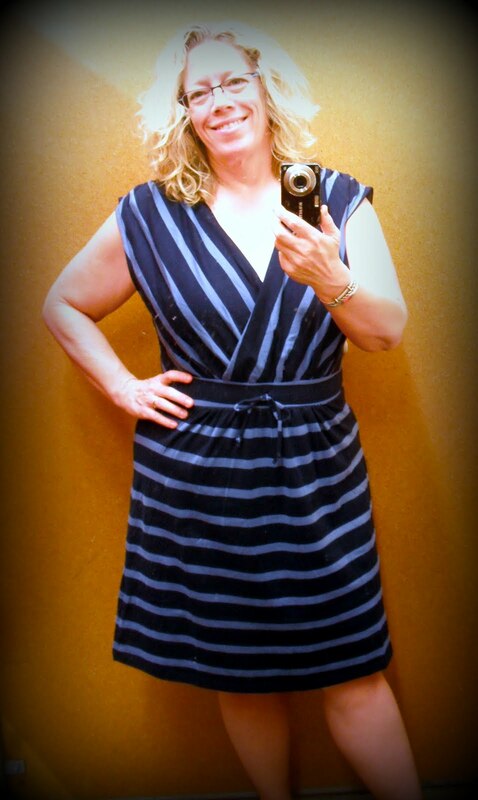 I hate when not all parts of dresses fit, since they're my favorite item of clothing to wear and buy! Great pictures & happy weekend, Shelley! "you mean you can go shopping and try on clothes without buying them all?! What a concept. I'll have to try that. :)"
OMG, I just realized that sounds like I'm criticizing YOUR shopping when I was really referring to ME! Geez. Sorry about that. I'M the one who feels like I should buy something if I try clothes on. Anyway, wanted to clear that up because sometimes things do not come through just right on electronic media. The boating pictures are the BEST!!!! Genuine fun is being had by all!!! :) Have a wonderful weekend Shelley!